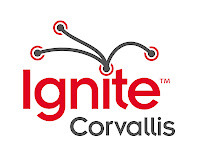 Thanks a ton to Loyan who shot, spliced, produced, and uploaded the videos for Ignite Corvallis 1! Wow! The High Tech After Hours and the Ignite Corvallis went very well. The Ignite brought in more people than the room could hold. We will need to think about different venues for the next time we do it. We did 13 presentations and some of them were just hysterical. I am still chuckling about the Re-newable Corvallis talk by Ravi. It was generated a lot of conversation. We will do a debrief next week. If you have comments good or bad, now is the time to post them. I wanted to find a cool visual of the tweets for Ignite Corvallis and I stumbled across a tool that is the equivalent of a twitter DeathMatch! 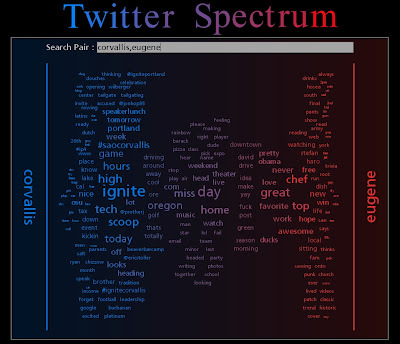 Check out Twitter Spectrum and put in any 2 terms to compare. I put in Corvallis vs. Eugene and look at all of the Corvallis related tweets! Corvallis has tags like Tech, Ignite, BeaverBarCamp, SAO Corvallis, and SpeakerLunch. Where as Eugene has tags like sitting, watching, and reading. Sounds boring to me! And the cloud on the left looks bigger doesn't it? Alright, so maybe this doesn't prove anything, but its fun anyway. Our First Ignite Corvallis Was Great! Thanks to all those brave souls who were thrown into the fire and came out OK. Everyone did a great job! Can't wait until next time! Comment here if you have any praise/comments/suggestions for future Ignites! Come on down to Ignite Corvallis at the CH2M HILL Alumni Center @2:30pm and see all of the cool presentations! Its going to be fun! The Corvallis High Tech After Hours is coming up on Thursday 11/13 starting at 1:00pm and going until 8:00pm. It will be held at the CH2M Alumni Center at OSU. 2) Peter Adkinson invented some seriously cool games and has been successful in business around those games including Magic: The Gathering and Dungeon and Dragons. 3) Get to know the people who are doing High Tech Business in the area. There are people here who are doing well. 4) Some of our interesting startups have gotten tables. We have some interesting technology companies spinning up. 5) People who are looking for jobs will likely wander by, so if you are hiring, you might want to wander by too. 7) Leadership Corvallis will be coming over and participating, see who is engaging in the Leadership program this year.